This is a fascinating account of an American woman who was way ahead of her time. After training for and winning the Olympics in Paris 1924 she goes on to become the first woman to swim the English Channel. She also beats the previous record set by men. Born October 23, 1905 in NYC she trained for the Olympics by swimming from Battery Park in NYC to Sandy Hook, New Jersey against the tide. The distance was 21 miles. At one point she was actually swimming in place for 2 hours! Another favorite spot for her to train was the shorter distance between Manhattan Beach in Brooklyn to Brighton Beach. The Paris Olympics of 1924 included swimmers like Johnny Weissmuller who would later go on to play Tarzan in the movies. Jabez Wolffe, her trainer for the crossing, was a 22 time failed aspirant but knew the currents and risks better than anyone else. With his steady hand and knowledge of the endeavor she was about to undertake he guides her to sucess. One of the biggest problems she faced was the drag created by the women's swimsuits of the day. Although these were not the skirt and leggings type of suits, they were made of heavy wool, which added weight. She needed something better. So she made her own version of a bikini by cutting the suit into a bra and shorts. Slathered with crude oil to ward off the cold of the frigid waters in the Channel she went on to triumph over the elements and set new standards for women everywhere. Arriving home to New York she is given a Tickertape Parade the likes of which would not be seen again. The Parades for Lindbergh and even the World War Two Victory Parades (VE and VJ Day) would be dwarfed by comparison. Set against the backdrop of the 1920's and flappers and jazz, the book is written in a very readable fashion. With the aid of Gertrude Ederle's niece, who kept every newspaper clipping about her famous Aunt, the book is an accurate and inspiring story of the determination it takes to make dreams come true. 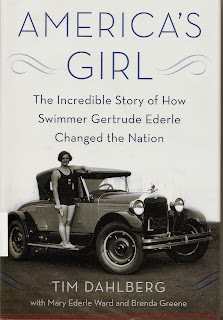 And swimming must be good for you- Ms. Ederle passed away at age 98.